Learn the Revision total Knee Replacement- Legion Rotating Hinged Knee (Legion RHK, Smith & Nephew) surgical technique with step by step instructions on OrthOracle. 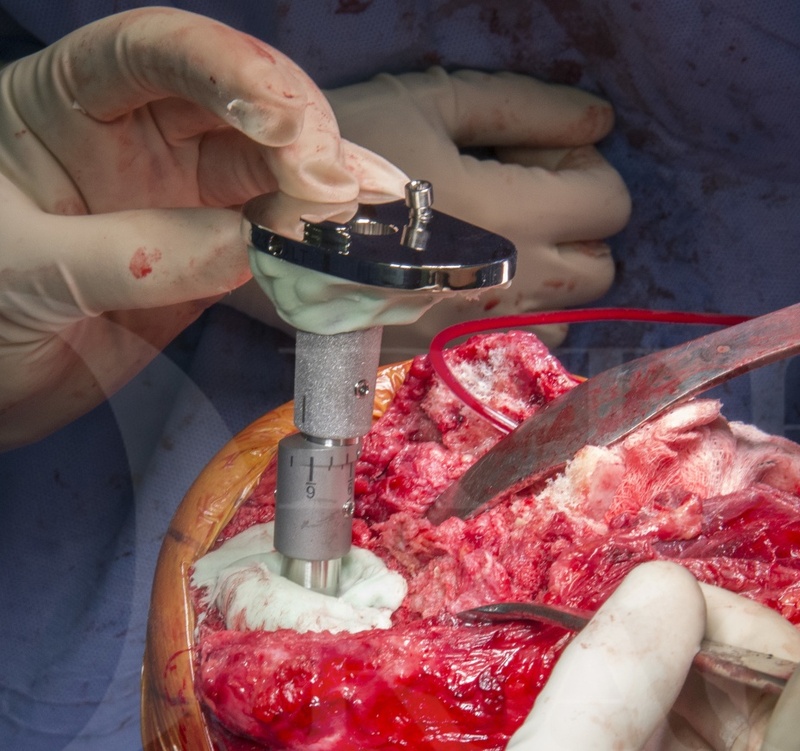 Our e-learning platform contains high resolution images and a certified CME of the Revision total Knee Replacement- Legion Rotating Hinged Knee (Legion RHK, Smith & Nephew) surgical procedure. The LegionTMRevision System (Smith and Nephew) is a very flexible revision knee reconstruction system which allows the surgeon options of cemented or hybrid fixation with uncemented stems, offsets from 2 to 6 mm and a cone system to reconstruct zone 2 uncontained defects. A particular benefit of this system is the ease of conversion to the Legion Rotating Hinge Knee (RHK). The Legion RHK maintains the system benefits of the Legion condylar constrained knee (Legion CCK) yet offering the increased stability, but rotational stress-shielding of a rotating hinge design. Thankfully the ability to offset stem and tibial and femoral components is retained. This case highlights instability post knee arthroplasty, a situation which is not infrequently contributed to, or caused, by primary implant malalignment. Whenever a total knee replacement(TKR) starts to fail the patient usually complains of pain, swelling, instability or stiffness. Infection however must always be considered as prosthetic joint infection counts for a substantial percentage of all revision knee replacements, approximately 30%. In this case however there were no reasons to suspect infection and the investigations were standard for revision TKR, including plain radiography and CT scanning. Basic blood tests are performed prior to revision replacement including full blood count, urea electrolytes and creatinine, liver function, group and save and of course a CRP. As the CRP was normal, no aspiration was performed prior to revision, but sampling in Oxford manner was of course performed with 1 fluid and 5 tissue specimens in addition to histology sampling. This is the case of an 84 year old lady who had achieved an excellent result following right TKR, but continued to deteriorate following left TKR. The development of pain or swelling in a previously happy TKR should be a warning sign for all, but similarly if a patient can achieve a good result on one side, there is likely to be a cause why the new painful TKR is problematic. Approximately 15-20% of patients after a total knee replacement will have some degree of pain, but this certainly does not mean they should be revised. Instead a diagnosis needs to be worked out and only if this fits with the patient symptoms and there is a surgical solution to correct the technical problem without compromising the patient should revision TKR be performed. In this technique I will focus on the reconstruction technique using the Legion Rotating Hinged Knee (RHK). However there are also more general points and important principles in revision knee surgery which this case and technique illustrate. The important stages of a revision knee replacement for me are; diagnosis, investigation, preoperative planning, approach including backup plan for extension to improve access, sampling, debridement and extraction, joint line assessment and reconstruction, management of bone loss, fixation strategy, implantation, closure and rehabilitation. A whole text book could be written on these alone. I hope you find this triggers an interest in a hugely expanding field of orthopaedics which is technically demanding, but hugely rewarding. Similarly I hope that you find as much success in the use of RHKs as we have found in Bristol; they are extremely valuable in the complex primary knee replacement when needing to correct gross valgus deformity with associated medial collateral ligament deficiency as well as in the revision TKR population with collateral insufficiency. Author: Mr James Murray MA FRCS (Tr and Orth) MB BChir (Cantab). Institution: The Avon Orthopaedic Centre, Southmead Hospital, Bristol, UK. Author: Author: Mr James Murray MA FRCS (Tr and Orth) MB BChir (Cantab). Institution: Institution: The Avon Orthopaedic Centre, Southmead Hospital, Bristol, UK.